Phillips, Commander Rex (1931-2015 ). Oil on canvas board; signed (LR). Verso is Mall Galleries' 1984 Exhibition label with title "Atlantic patrol 1941 - KGV and Walrus".. The battleship HMS KING GEORGE V was laid down under the 1936 Naval Construction Programme, the name ship of a class of five, KING GEORGE V, ANSON, DUKE OF YORK, PRINCE OF WALES and HOWE. KGV commissioned in October 1940 under the command of Captain W R Patterson and joined the Home Fleet as a 'private ship' (ie not a flagship) and her first six months in service saw her ranging the North Atlantic. In January 1941 she conveyed Britain's new ambassador, Lord Halifax, to the United States, and two months later she covered a landing force on the Lofoten Islands before embarking on a search for the German battle cruiser SCHARNHORST. 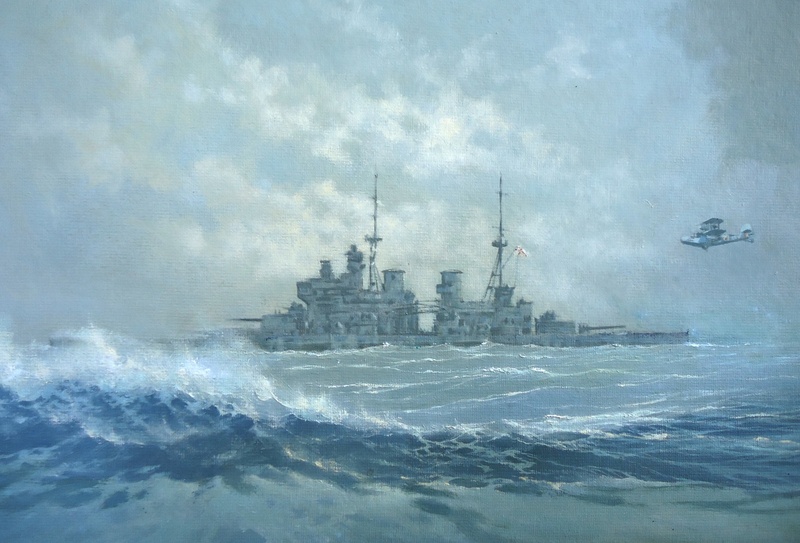 By now fully worked up and with some operational experience under her belt she hoisted the flag of the Commander-in-Chief Home Fleet, Admiral Sir John Tovey KCB DSO, and shortly afterwards became involved in the BISMARCK action, the attempt by the Home Fleet to prevent the German battleship breaking out into the North Atlantic. KGV played a decisive role throughout in orchestrating the search, prosecution and subsquent sinking of the BISMARCK. This painting dated 1941 by the artist is possibly in that period in 1941 before she became Tovey's flagship as Rex Phillips, invariably a stickler for such detail, gives no indication of the cross of St George flying from fore or mainmast which would have denoted Admiral Tovey's presence. Commander Rex Phillips RN (1931-2015) was a very capable artist and although without formal art training, his 34 years in the Royal Navy with much of that time being spent in aircraft carriers, cruisers, destroyers and frigates (his specialisation of navigation would have required him to spend lengthy peiods of the day and night on the bridge) made him an excellent observer of events as seen from the bridge. This coupled with service on most of the seas and oceans of the world provided a wealth of material and professional background on which to draw and it also fine tuned his artist's eye when it came to getting shapes of ships "right" and ensuring that the details with which he furnished his paintings were accurate - he brought a professional seaman's eye to them all, the sea in all its states, and the ships. He exhibited over many years at the Royal Society of Marine Artists' (RSMA) annual exhibition in London and was a member of the Armed Forces Art Society and his works can be found in collections in America, France, Norway, Australia and Holland as well as in UK. including those in the National Museum of the Royal Navy, naval establishments, the Royal National Lifeboat Institution and many other institutions and private collections. This painting portrays the squat, very businesslike though rather graceless form of these battleships well and on the back of the canvas board he has written in pencil "Rex Phillips - Nov '83" as well as on the Mall Galleries label ("Exhibition - Boat Show 1984") his address of "15 Westbourne Avenue, Emsworth, Hants. Price in Pounds: £120".